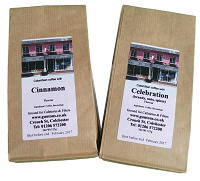 Four selection packs of ground coffee in 50g taster packs for you to try out our range at minimal expense. Coffees from Brazil, Costa Rica and Nicaragua. A guest coffee, currently a stunning espresso blend of 23 coffees from Italy. Colombian coffee with various flavourings.